Much of Scruggs-style banjo playing is based around roll patterns — right-hand sequences of notes that crop up again and again when playing in this style. Roll patterns are made up of eight notes played by the right-hand thumb, index, and middle fingers. As a general rule, you use a different right-hand finger to strike a different string for each consecutive note when playing a roll pattern (in other words, you don’t want to use the same right-hand finger or hit the same string twice in a row). This way of playing creates a smooth and constant flow of notes and is a big part of what make Scruggs-style banjo sound so great. Alternating thumb roll: The right-hand sequence of this roll is T-I-T-M-T-I-T-M. Use this sequence with the following string order: 3-2-5-1-4-2-5-1. Forward-reverse roll: This roll’s right-hand sequence is T-I-M-T-M-I-T-M and uses a string order of 3-2-1-5-1-2-3-1. Note that this roll begins like the alternating thumb roll but moves in a new direction with the third note you play. Forward roll: This roll is very exciting to play in bluegrass banjo. You can play with more power if you kick off the roll by using your right-hand thumb, as indicated in the tab’s right-hand sequence: T-M-T-I-M-T-I-M. This example uses the following order of strings: 2-1-5-2-1-5-2-1. 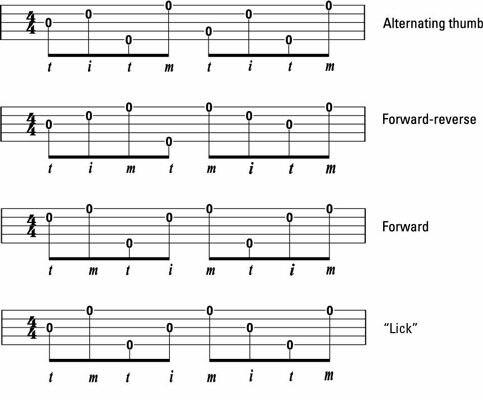 The “lick” roll: This is the roll you use for the most frequently played fill-in lick phrase in bluegrass banjo. This roll starts with the same sequence of right-hand notes that you use in the forward roll but then shifts to the sequence used in the last four notes of the forward-reverse roll: T-M-T-I-M-I-T-M. The string order for this example is 3-1-5-3-1-3-5-1. Foggy Mountain roll: Yes, this is the roll used to play the first measures of “Foggy Mountain Breakdown”! Be careful to play the first four notes of this roll correctly: Begin with the right-hand index finger striking the 2nd string and the middle finger playing the 1st string but then be sure to use the thumb to strike the next 2nd string. This approach provides you with more speed and power as you get comfortable playing this roll. The right-hand sequence is I-M-T-M-T-I-M-T, playing these strings: 2-1-2-1-5-2-1-5. Backward roll: This roll begins with the middle finger and moves backward towards the 5th string. Note the right-hand sequence for this roll: M-I-T-M-I-T-M-I. The strings indicated in the tab example are 1-2-5-1-2-5-2-1. You often use this roll when the melody note is on the 1st string of your banjo. Middle-leading roll: As you may have guessed, you use the middle finger a lot in this roll pattern as revealed in the right-hand sequence: M-I-M-T-M-I-M-T. The strings you play in this example are 1-2-1-5-1-2-1-5. This roll is also called the Osborne roll after banjo great Sonny Osborne. Index-leading roll: This roll begins with the right-hand index finger playing the 2nd string. The right-hand sequence for this roll is I-T-I-M-I-T-I-M. The strings played in this example are 2-3-2-1-2-3-2-1. 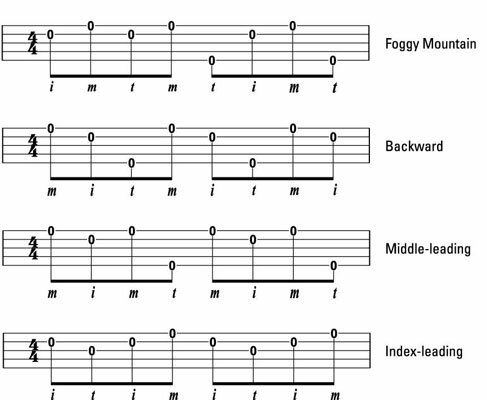 Listen to the audio track Scruggs-style Roll Patterns to hear the sound of each roll and to double-check your playing against these tab examples. Practice these rolls until they become second nature. You can then cover ground much faster when you encounter these roll patterns in actual tunes. A great way to internalize these patterns quickly is to use them as an accompaniment to your favorite songs. After you’re comfortable with the chord progression of any song, you can play any of these rolls to accompany a guitarist or singer. Each roll pattern takes up one measure in a chord progression. Try as many as you can, settling on what sounds best to you.